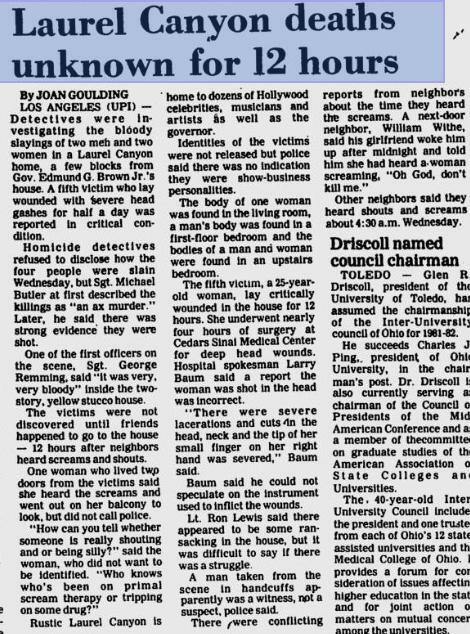 This article from July 2, 1981 does not mention movers finding the bodies, but rather “friends stopping by”. If only so many authors and writers over the years had dug a bit deeper, then the movers thing would not have been publicized so much. A few neighbors also talk about the house and that night. But, when you talk to neighbors about a crime they always say different stuff, whether it’s time-stamping a scream, or making vague comments about the victims. One lady awoke, and actually walked out on her balcony, but did not see anything and went back to bed. The man taken from the scene was Julia Negron’s friend, “B”. He was released at the scene after sitting in a squad car for a few minutes. Also, LAPD Sgt. Michael Butler needs to make up his mind on the cause of death. In tomorrow’s post, you get to hear from a neighbor who says “police have been there before because of all of the violence”. (?) I have read about the partying, but did the cops really come for fighting and violence. I would suspect it was men fighting (i.e., Ron blew his lid with some guy and beat ’em up). UPI Article. July 2, 1981. Would you happen to know Nurse Michael’s last name…Gary Fontenot’s room mate during this time. No Pat, but I can check with Lee, the Starwood guy who worked for Gary. Another reminder to me on how brutal this murder really was….. Yes, I know his name but didn’t want to post it. He’s some sort of music big shot. “She heard a woman screaming ‘Oh God, don’t kill me'”.. That just about chilled me to the bone! One can only assume they were Joy Miller’s final words before dying a horribly painful death. The severity of the crime really hits home when you read something like that. So very sad. I very much doubt that the house was a party place like depicted in the movie. I recall Julia Negron supporting this claim too and it just makes sense that Ron, Billy, Joy et al would’ve tried to keep a low profile with all the nefarious goings on. It was a drug house after all, with a fairly extensive clientele by the looks of things, so I doubt they’d want to advertise that fact to their neighbours. Also, just how popular was primal scream therapy back then? The fact that some neighbours thought it was that rather than someone actually crying murder just floors me.. What the hell?! I think that if people were stopping by a lot and some crashing at the house, then there would have been some noise and chatter. The homes are so close together. Any “noisy parties” would just be that much louder, even if there were only 4 or 5 people, with music playing. It would sound like a big party. Those homes are 10′ apart! Where did I read that Christina Applegate lived close by and well remembers the mayhem with police and traffic after the murders.